Featuring outstanding artists from a wide variety of genres , Olbrich is pleased to present three annual concert series. With the great melting pot of musicians Madison has to offer, visitors can enjoy everything from blues, jazz, and rock, to folk, classical and singer/songwriter acts. Enjoy a winter Sunday at Olbrich with musical performances in our Evjue Commons.Â A variety of music genres are featured. All Winter Concerts are traditional theatre-style seating. 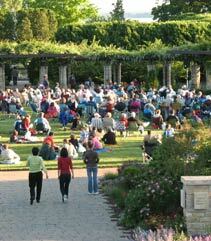 Enjoy your summer evenings with a concert on the Great Lawn of Olbrich's outdoor gardens. Bring a lawn chair or blanket, pack a picnic, or purchase hotdogs and brats at the Gardens from the Madison East Kiwanis. Picnics are allowed in the Gardens for Tuesday concerts only. In case of rain, concerts will be held indoors, and the Kiwanis brat and hotdog stand will not be available. We will post the decision for an indoor/outdoor concert on our Web site after 3 p.m. on the days of the concert if the weather is questionable. Warm up your Sundays in December with festive holiday music during Olbrich's Holiday Concert Series. Don't forget to check out Olbrich's Holiday Express while you're here! Seating is provided. All concerts are sponsored by the Olbrich Botanical Society.